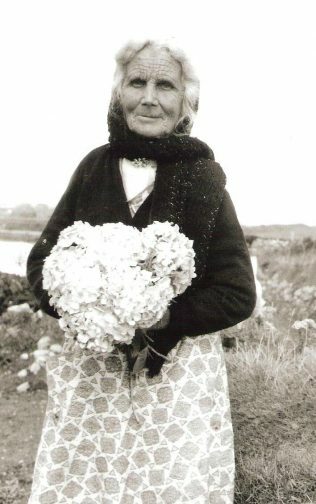 Honour Kilbane was born in her Grandmother’s house in a small village on Achill Island, Co. Mayo called The Valley on the 14th August 1893, the second daughter of Peter and Celia Kilbane. They lived in a village named Dooniver. She lived in her Grandmother’s house until she was 7yrs old then she went to live with her parents and siblings. She attended school in Dooniver. 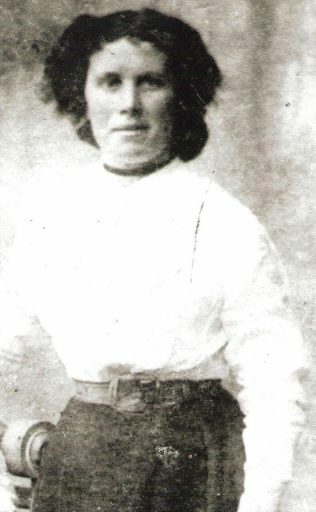 At the age of 11 years she immigrated to Scotland to work in the potato fields, working as a tatty hoker. She was accompanied by her older sister Mary. 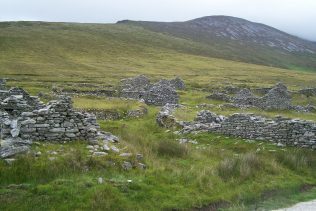 The accommodation provided for them were barns (Bothy) that cattle used in the winter. They made beds of wooden potato boxes as a base, mattresses were hessian bags filled with straw. Mice were constant companions. They cooked on an open coal fire. They travelled on the cattle boats from Dublin to Scotland. They went to Scotland from May to November. They went to the local town to shop for supplies on Saturday.The local people treated the Tatty Hookers with great suspicion. They called them names and some shops refused to serve them. They had a very poor quality of bread for them. Honour and her sister and two cousins bought material for dressmaking from which they made lots of clothes such as aprons, blouses and skirts for themselves and the family back home. They made these in the bothy in the evening after they finished work in the potato fields. People from other “Bothys” came to visit at the weekends. They sang songs, played music, danced and had a big party and sometimes local Scottish young people would come to the parties. They would receive a great welcome when they returned home in November. They then returned to school from November to May. Honour’s marriage to Joseph Cafferkey (12-12-1893) was arranged or in other words ‘a match’. Joseph and his brother came to her parents’ house and asked for her hand in marriage. She was in bed with her two sisters and was not invited to the kitchen to be part of the discussion and she was not allowed see him beforehand. They could hear all of the details from behind the closed door. She married Joseph in the Franciscan Monastery in Bunnacurry in 1919. She had not seen or met him till she arrived at the altar. 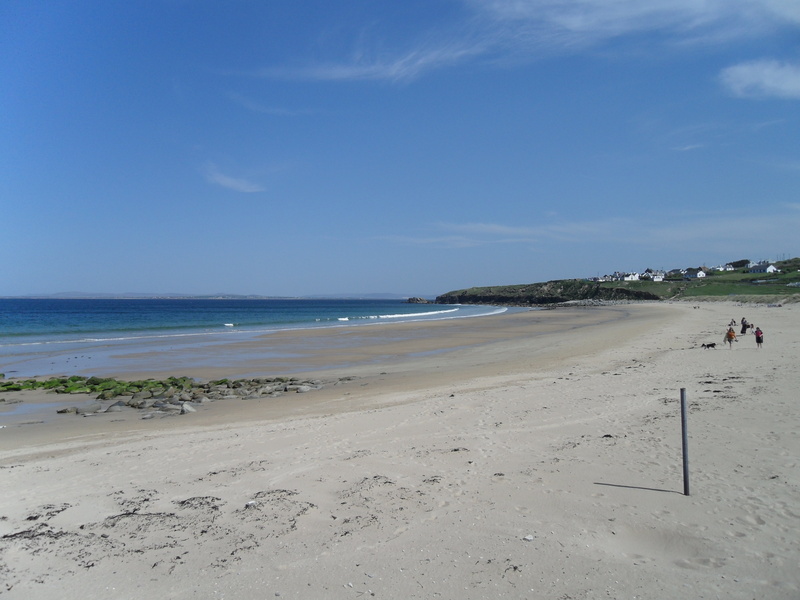 She went to live with him in the village of Bunnacurry, 5 miles from her home. They farmed 9 acres of land. Her mother-in-law Bridget (Doran) lived with them. (1852-1924). The house had one bedroom as well as a kitchen. There was a slated roof and no running water but instead there was a spring well 550 meters away. The graveyard was close by and she had to walk past to get to the well and her land. She found this very scary in the dark evenings of winter as there were lots of ghost stories told in that time. Joseph and Honour were English speakers. Joseph was a very clever man with a photographic memory. He was a fluent Gaelic speaker, a historian, singer as well as a story teller. Their house was known as a visiting house. They had 4 children, Bridget and John as well as twins Michael and Patrick. Joseph suffered from asthma. He immigrated to England to work on the farms. The work was very heavy and the accommodation was garden sheds. These living conditions were detrimental to his health. In 1932 he had to return home in November because he was very ill. He never went back to England again. This plunged the family into severe poverty. Honour worked for the Franciscan Brothers on the bog saving turf and picking fruit (blackcurrants, redcurrants, gooseberries). She worked her farm rearing cows, pigs, sheep, and fowl. She loved chickens and reared them for eating and egg laying. She would have 50 fowl at a time, consisting of hens, geese and ducks. She sold eggs in exchange for flour, tea and sugar. She was a talented gardener growing potatoes, vegetables and lettuce. She saved turf for fuel to cook and to heat the house. She saved hay to feed the cows, horse and sheep on the farm. She grew oats to feed the family and the fowl. She sheared the sheep herself and carded and spun the wool to thread. The thread was wound into huge big balls weighing up to 10 pounds this was the pastime on the long winter nights (no television or radio then). The thread was taken to the local weaver to be made into blankets. The blankets came back in long narrow strips that were sown together to make blankets wide enough to cover the bed. The blankets were beige edged with a herring bone pattern in a brown or grey colour. The new blankets were made in the summer time. The blankets were very treasured items in all households. She loved to experiment with dye on the wool using blackberries to get a lovely shade of lavender. Lichen to get a grey colour, tree bark to get a rust colour. She knitted jumpers for the children and socks for the men. She made clothes for herself and the children. She could use old jackets to make trousers for the boys. She always sewed by hand. She loved to make curtains and patchwork bedspreads. She made sheets from the flour bags, which were linen. This was a very time consuming task. The bags had to be washed many times to get the flour and labels off the material. They were then sown together, 8 bags were needed made a double bed sheet. One bag could make a pillow cover. The bags were used to make vests for children and adults. The bags made school and shopping bags. She was very talented and artistic and made flowers from crepe paper in bright colours. The big wash of the year was done in July of each year. This consisted of all the winter clothes, blankets, curtains and sheep’s wool. This laundry was taken in hessian bags on the donkey and cart to the local lake. A fire was lit and two big cast iron pots were filled with water and placed by the fire to boil. Bars of soap were sliced into the boiling water (there was no soap powder at this time). The clothes were washed in wooden tubs. The woollen blankets were placed in the tubs and hot water poured on top. The children got into the tub and danced on the blankets to clean them. The blanket was turned and the dance continued. The water was poured away and the soft lake water was poured into the tub to rinse them. They were carried back in a wicker basket and spread out on the gorse bushes to dry. They had a kettle to boil water and make tea and a big picnic was had by all. When the laundry was complete all the items were loaded on to the donkey and cart. Later on that evening they returned to collect the dry clothing and blankets into hessian bags and carried them on their backs home. When she returned home the fowl had to be fed, all the household chores completed she would go up the mountain and find the cows and milk them. This was a round trip of 5 to 8 miles. Honour was a great cook. She cooked on the open turf fire. She baked soda every day of her life until she was 89 years old. She could make pan cakes that were filled with air bubbles using a fork as a whisk that were delicious. At holidays such as Christmas, St.Bridget’s day she would make a “spiced soda bread”. This cake was make with raisins, currants spices, apples sugar that was the most delicious I have ever tasted. She made potato cakes, boxty, apple and rhubarb tarts, soda bread and spiced soda bread all baked in a pot oven over a turf fire. She made lots of jam from blackberries, rhubarb and apples. Honours eldest son John became ill and was diagnosed with Hodgkin’s disease when he was 15 years old, she took him to every doctor she heard of hoping to find a cure for him, the local vicar sponsored him to go to Mercers Hospital in Dublin for a number of months but unfortunately he was sent home to die. She lovingly nursed him for months before he died aged 19 years on the 18th February 1944. Honour was a very religious person. She was devoted to her Catholic religion. She had a great devotion to the Virgin Mary and the Sacred Heart of Jesus. She attended Mass every Sunday morning and Benediction in the evening. She went to 8am Mass every day in Lent. I remember going with her as a child to the Franciscan Monastery down a long tree-lined avenue in the dark to a tiny church. She had a special devotion to the Sacred Heart and completed the devotion of the “First Nine Fridays” for over seventy years. At six o’clock she sat the family down and we all made St. Bridget’s crosses. She then got a shawl, holy water and the crosses went outside in the dark, walked around the house three times knocked on the door each round third time she spoke in Irish mise Brid we as children opened the door knelt down, she blessed us with holy water gave each of us a cross. She entered the house praying we all knelt and recited the rosary she then placed a cross on the mantelpiece in the kitchen over the front and back door. We all sat at the table and had a lovely tea of all the cakes she had cooked. In the morning a cross was placed over the door of the stable to protect the animals. Honour loved music and song. She enjoyed attending plays in the local hall in the season of lent. She could tell a good ghost story and loved to entertain visitors when they called to her house. 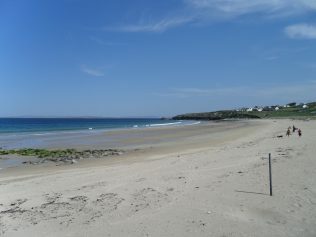 In summer she would welcome all her relations who came to holiday on Achill Island from England and the USA. She had a wonderful knowledge of genealogy people would call to ask her about their Family Tree, she helped lots fill in the blanks of relations long passed. Honour went to her eternal reward on the 16th June 1983 in her own bed surrounded by her family. May her gentle soul rest in peace. She visited her neighbours who were ill, had new babies or were in trouble she lived her Christian religion all her life. She lived beside the Graveyard, in the month of November people came from far and near to tend the graves of their departed she always helped them and supplied equipment to them. As people travelled on foot or on bicycles she always had the kettle on the boil and fresh soda bread to feed anyone who called. She lived a simple and ordinary life but this simplicity was her true gift. Thank you so much for this beautiful tribute. Honour Kilbane is my grandmother, Katherine Gavin’s (Kilbane), sister. I am the youngest brother of Tom Lynch who commented above. I currently live in Boise, Idaho with my wife & three children. Thanks again! Wonderful story. My dad was born on Achill, December 8, 1901, to Thomas and Bridget Fadian. He emigrated to Philadelphia, following his brothers and sisters, in 1923. We have visited Achill three time and plan a visit in the summer of 2019. I remember Nora so well shearing the sheep down at the old stable. The well road was a hive of activity always meet somebody walking to the well especially during a dry spell often coming from other villages. It’s so quiet and lonely now. A wonderful story and brings back memories of my Grandmother who passed in 1970 at the age of 97. She was reared in Glasgort near Ballintubber Abbey. She was able to sew knit and do everything u needed. A wonderful women this lady reminds me of her. The Kilbane clan on Achill Island we must be All related. My Father was born the youngest of seven Three sister and four brothers. I think. He was born in 1898, In Dooaga. Only ever met one of my Uncles, Michael who emigrated to America. The all took there Fathers name as there middle name James. Superb story, very valuable to have as life is so different now. So very interesting. A hard and honest life. I married Seán Kilbane whose people came from Cloughmore Achill Is. His uncle Tony , Antony Kilbane lived to 104. No doubt due to that wonderful clean living clean water good food clean air. Honour Kilbane is my grandmother’s sister, Katherine Gavin (Kilbane) who moved to Cleveland, Ohio arriving in NYC on September 26, 1926. I’ve been gathering the Kilbane/Gavin family history. My Grandmother Katherine married John Gavin. My mother, Patricia, was their first born. I am Patricia Gavin’s son. I now live in Chicago. This is such a nice article. Thank you, Tom Lynch. She lived a beautiful life. What a wonderful story of life in Achill in the past. A lot of it resonated with my own mother’s life especially the weaving of the blankets. I still have one my mother made. Her name was Maud Lavelle from Keel. She also was a tattie hoker in Scotland wher she met and married my father John Taylor. Thank you for this glimpse of Achill in the past.